Rebecca Adlington and Liam Tancock dominated their events as English swimmers won three gold medals on the fifth day of competition in Delhi. 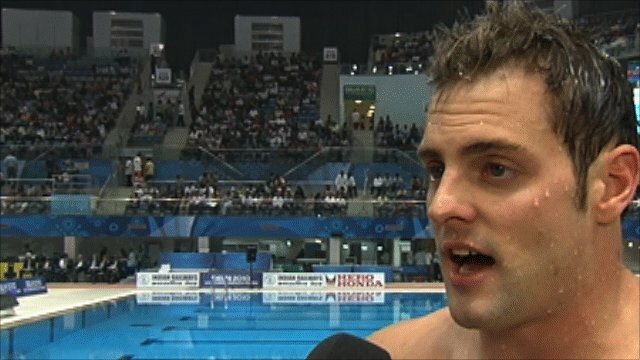 Tancock added the 100m backstroke title to his 50m gold, while Adlington took 400m freestyle gold after Thursday's victory over the 800m distance. James Goddard then led home Joe Roebuck in an English 200m medley one-two. Fran Halsall, Antony James, Lizzie Simmonds and Gemma Spofforth all won silver medals for England. Halsall finished second in the women's 50m freestyle as Australian 15-year-old Yolane Kukla narrowly won gold. James won men's 100m butterfly silver and Simmonds was pipped to women's 200m backstroke gold, as was Spofforth over the 50m backstroke distance - a race in which Wales' Georgia Davies tied for bronze. Scotland's Sean Fraser won Para S8 100m freestyle silver behind Australia's Ben Austin, while England's Kate Haywood earned 100m breaststroke bronze. Australia produced a one-two in that event as their Delhi dominance continued, and the Australian women reinforced their world-beating credentials with an easy victory in the 4x100m freestyle relay to end the day's racing, with England taking silver following Canada's disqualification. But Adlington produced a second peerless swim in as many days to win the 400m freestyle, with Jazz Carlin swimming to bronze behind her for Wales. Adlington took gold in a Games record time of four minutes, 5.68 seconds, well ahead of silver medallist Kylie Palmer of Australia, and the 21-year-old - who overcame days of illness to win both races - hailed her two victories in Delhi as a sign of things to come in 2011. "It's absolutely amazing. I thought I may as well just go for it," Adlington told BBC Sport. "I was really struggling this morning after the 800m, but I wanted this swim really, really badly. I got a taste for it last night. "To come here and win my main events is such a confidence boost, it sets me up for next year." Carlin, who finished in 4:08.22, added: "I'm really pleased with that, I felt awful this morning, but I'm so happy to come away with another medal." Norwich 17-year-old Anne Bochmann produced a personal best to finish fourth behind Carlin. Tancock triumphed for England in the 100m backstroke, the previous race in a medal-packed Friday programme, and declared it "pretty cool" to be a double Commonwealth champion. He produced a time of 53.59 seconds - another Commonwealth Games record - to win gold ahead of New Zealand's Daniel Bell and Australia's Ashley Delaney. "I'm really pleased with that, to come away with victory in a tough environment and with a tough crowd," said Devonian Tancock, who defended the title he won in 2006. "I did it four years ago in Melbourne, and I did it today. Everyone says I'm a 50m swimmer and I know I'm not. "The 50m is just a bonus. I do love it, but the 100m is the one I want to go for, it's the Olympic event. I just love racing." Goddard, who won the 200m backstroke title on Wednesday, continued his excellent Commonwealth Games as he won the 200m individual medley in 1:58.10 ahead of Roebuck, who finished in 1.59.86, with Australia's Leith Brodie taking bronze. "I've been working on my turns but I didn't expect to be this good in the water, there are a lot of gains to be made on it because the Americans are even better," said Goddard. "I'm really tired after that," said Roebuck. "I'm a bit disappointed with my times but I'll take two silvers at this meet." Returning veteran Geoff Huegill had earlier set the tone for Australia as he swam a new Games record, in a time of 51.69, to win the Commonwealth 100m butterfly gold for the third time in his career - the first coming 12 years ago. 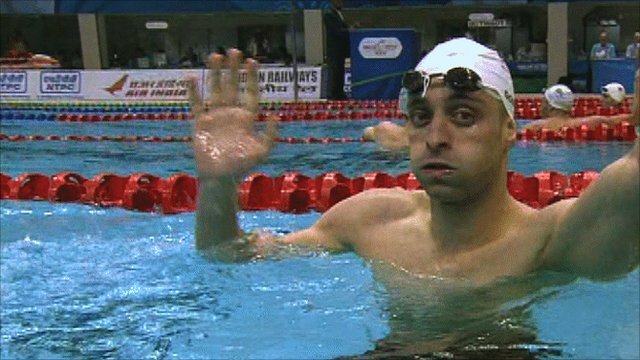 The 31-year-old, who retired after the Athens 2004 Olympics and lost more than seven stone to return to international competition in Delhi, had already taken 50m butterfly silver. James tied with Papua New Guinea's Ryan Pini for the silver medal in 52.50 seconds, with Andrew Mayor of Scotland seventh. James said: "I came into the race thinking, 'swim your own race, hit it hard and see what happens'. To come away with silver is amazing. "I'm only 20, most of these guys are years ahead of me. I'm really happy." Halsall, another 20-year-old, was similarly philosophical about the years ahead of her as teenage prodigy Kukla beat her to 50m freestyle gold, with England's Amy Smith back in seventh. Kukla, who has only just turned 15, touched in a time of 24.86 seconds, with Halsall just behind in 24.98. "I'm really disappointed. I haven't got any energy really," said Halsall, who - like many swimmers from Australia and the home nations - has suffered from illness for most of the opening week of the Games in Delhi. The Southport swimmer's time was 0.31 seconds outside her fastest time of the year, set at the European Championships in August, and even that only won her a bronze medal. "I had a bit of a lie-in this morning and started to feel much better, and thought I'd be good to go," she added. "I've got three medals so I can't be too disappointed, but it's not the order I wanted them in. I'm still 20 though, I could do another Games if I want I suppose." In the 200m backstroke, Australia's Meagen Nay produced a Games record 2:07.56 to outstrip Simmonds in the dying seconds of the race, as the English swimmer took silver in a time of 2:07.90. Emily Seebohm added a bronze for Australia, with English duo Gemma Spofforth and Stephanie Proud back in fifth and sixth respectively. "This week's been pretty tough but a lot of people are going to be saying that," said Simmonds, 19. "I had a strong swim but I went in there to get the gold. It's my first Commonwealth Games though, so I can't not be happy with the result. "The last 100m was done in a little bit of a daze, it was one of the hardest 200m backstrokes I've ever done." Spofforth, who took silver behind Simmonds in this event at the European Championships, was more scathing about her own performance in Delhi. "I'm finding it really hard to get up and get motivated," she told BBC Sport. "I don't know if it's the atmosphere. I thought I was a mentally tough swimmer. "It's been a really long season, it's gut-wrenching to know that Europeans wasn't our main event but that's the one I swam better at." But the 22-year-old picked herself up to win silver in the 50m backstroke event later on Friday, finishing just 0.03 seconds behind Australia's Sophie Edington, while Davies and Emily Seebohm of Australia could not be separated for bronze. Grimsby's Haywood, 23, won 100m breaststroke bronze as Leisel Jones took gold ahead of team-mate Samantha Marshall, despite a goggle crisis in the immediate build-up to her final. "I had a massive panic because I didn't have my goggles, but Lizzie Simmonds saved the day and got me a pair," she told BBC Sport afterwards. Of the race, which Jones won for the third Commonwealth Games in a row in a time of 1:05.84, Haywood - who finished in 1:08.29 - said: "I would like to have gone quicker. I've still got a lot of work to do, but I can't complain about getting another medal." She will move to Melbourne at the end of October to train alongside Jones and fellow Australian breaststroker Sarah Katsoulis. In the men's Para S8 100m freestyle, Fraser edged between gold medallist Austin and fellow Australian Blake Cochrane to earn silver for Scotland in a British record 1:00.77, with David Roberts - 11 times a Paralympic champion - fourth for Wales, swimming against less-disabled athletes. "I watched the finish on the big screen and it was a little bit of a glide, I could have been closer. It's agonising," said the 20-year-old Fraser. South Africa's Cameron van der Burgh put in the fastest 50m breaststroke time in the world this year, a Commonwealth Games record of 27.18 seconds, to win gold and complete a 50m-100m double. New Zealand's Glenn Snyders and Australia's Brenton Rickard tied for second place with England's Daniel Sliwinski seventh. English duo Simon Burnett and Adam Brown made it through from the 50m freestyle semi-finals, qualifying in seventh and eighth place, despite Burnett diving in too early in the second semi. 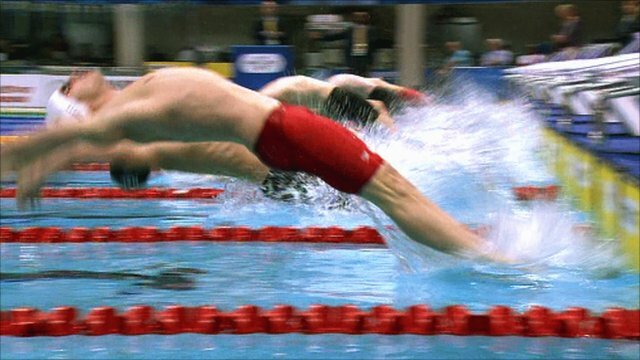 The Oxford 27-year-old was one of two swimmers to go before the start after hearing a shout from the crowd, and was duly given a rare second chance to compete by the referee. "One guy in the crowd got a little bit excited after 'take your marks' - and when the starter said 'stand up' I just went," explained Burnett. England's women gained a silver medal at Canada's expense in the 4x100m freestyle relay, Friday's finale, as the Canadians - who finished the race in second place - found themselves disqualified for a takeover offence. Australia won in a time of 3:36.36, almost four seconds ahead of the English, with Northern Ireland promoted to bronze-medal position.